Earnings season tracker got a little bit better over the past week. S&P 500 Index earnings growth is now tracking to +24.6% year over year for the second quarter, a solid 4% above June 30 expectations and 0.2% above the prior week. Revenue growth is tracking to +9.4% year over year, well ahead of the prior 8.1% estimate and up 0.1% over the past week. The beat rate for revenue also rose 1% to 72%, impressive at this late stage of reporting season with 93% of the S&P 500 results in the books (the earnings beat rate held at 79%). Perhaps most impressive, forward four-quarter estimates have risen 0.6% since June 30 and continue to point to limited tariff impact on companies’ outlooks. The week ahead. This week (August 20-24), the minutes from last month’s Federal Reserve (Fed) policy meeting are due out ahead of a speech from Fed Chairman Jerome Powell on Friday at the Kansas City Fed’s annual symposium in Jackson Hole, WY. 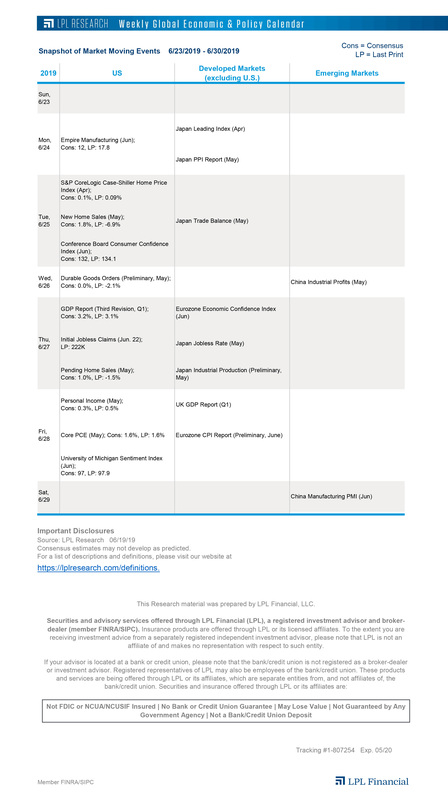 The economic calendar is highlighted by several data releases on the U.S. housing market, along with Purchasing Managers’ Index releases for the U.S., Eurozone, France, Japan, and Germany. Track these and other important events on our Weekly Global Economic & Policy Calendar. Meanwhile, trade negotiations will resume on both the NAFTA and China fronts. Tariffs on $16 billion more of Chinese goods take effect Thursday as U.S. and China trade officials hold talks in Washington, D.C. Finally, earnings season winds down with 18 S&P 500 companies slated to report. LEI rises for a 26th straight month. The Conference Board’s Leading Economic Index (LEI) increased 0.6% in July, its 26th consecutive monthly gain and higher than consensus estimates for a 0.4% rise. The LEI, which is a composite of 10 economic indicators (like manufacturers’ new orders, stock prices, and weekly unemployment claims), shows that the economic expansion is still intact and healthy. The LEI rose 6.3% year over year in July. The longer-term trend in the LEI is especially important, as the LEI has turned negative YOY before every economic recession dating back to the 1970s. Because of its strong track record in forecasting recessions, the LEI is one of our Five Forecasters in our Recession Watch Dashboard. Turkey’s currency crisis. It has been a complicated year for emerging markets. Most recently, Turkey’s diplomatic and political struggles have devolved into a currency crisis that has weighed on the world’s developing markets. In the Weekly Market Commentary and Weekly Economic Commentary due out later today, we examine the impact of this crisis on financial markets and the global economy. We’ll also highlight our thoughts on emerging-market stocks on the LPL Research Blog later today.